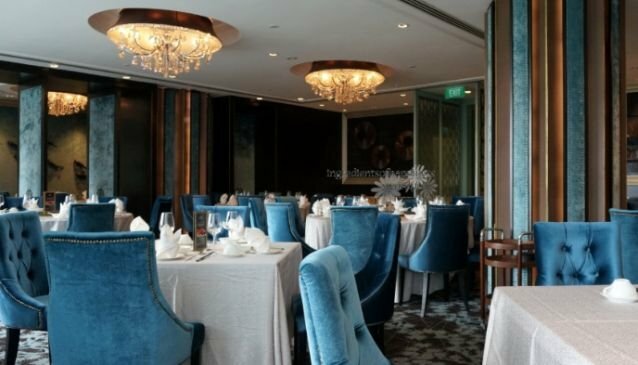 Overlooking the Marina Bay district, Paradise Pavillion is an elegant restaurant designed in the Victorian-style with pastel hues of turquoise blue and green, ceiling panels, delicate chandeliers and buttoned velvety chairs. Helmed by Group Executive Chef Fung Chi Keung and Paradise Pavilion's Executive Chef Chan Wing Kwong, Paradise Pavillion kitchen fashions a world of fine Chinese culinary pleasures. The elaborate menu features a wide selection of classic Chinese dishes and the restaurant's own concocted signature dishes. Along the walkway at the reception to the private rooms, diners can view the fire brick oven for the authentic wood-roasted Peking duck, which is the house specialty and is artfully crafted by a team of stellar chefs from China to ensure that the authenticity of this traditional delight. Paradise Pavilion offers what pavilions are traditionally built for - delighting all who come here with superb views and a slice of paradise.